When I was planning this "O Canada" series, I had envisioned it to run over a couple of posts while I was home in June yet the entries keep pouring in from my fellow countrywomen and I love sharing them on this blog. For the non-Canadians, I hope you're finding it interesting and for the Canadians, I hope it's reminding you what a great country we get to call home! "I mean, if friends were visiting Canada, you wouldn't tell them to go to Winnipeg." I had just finished telling someone how excited I was to be spending the next six weeks in my hometown, the capital of Manitoba, and this was her response. "But there's so much to do in Winnipeg!" I protested, and so went the all-too-familiar conversation with a fellow Canadian. And if most Canadians don't even consider visiting Winnipeg, how are we going to convince foreigners to come here? 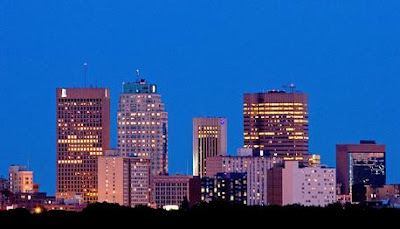 Winnipeg is one of the lesser-known cities of Canada; it doesn't have the international recognition like Toronto, Vancouver, or Montreal, nor does it have the worldwide draw of the Calgary Stampede or PEI's Green Gables, for example. That doesn't mean Winnipeg isn't worth visiting, not at all. In fact, it means that when you do visit, you'll be appreciated even more for taking the time to get to know our friendly prairie city. In the summer, the city is alive and green, with temperatures in the high 20s and low 30s and without any of that pesky humidity. There is an abundance of festivals to keep you entertained: the Jazz Festival, the Fringe Theatre Festival, Folklorama (a celebration of international cultures), and the Winnipeg Folk Festival, one of the top outdoor festivals in North America, to name a few. If you want to spend a day at the beach, Lake Winnipeg's Grand Beach is only an hour's drive away, and it's always a great time. 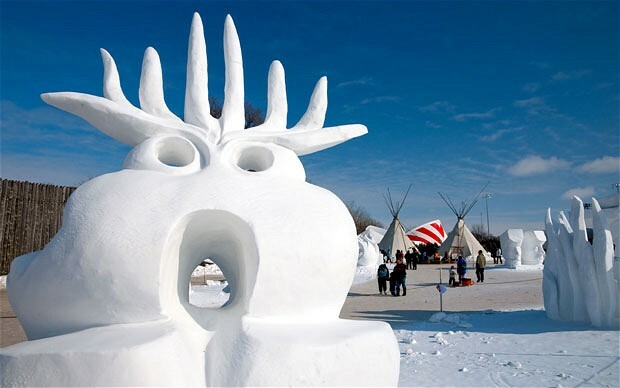 Winter, despite those -40 stretches, is not completely devoid of fun: there's Festival du Voyageur, and plenty of beautiful snowy days for ice-fishing, cross-country skiing, showshoeing, and snowmobiling. You haven't felt cold until you've felt a Winnipeg winter, but it's something everyone should experience at least once in their lifetime (cue "Winterpeg" joke). There's a strange beauty in the ice and snow of a prairie winter. 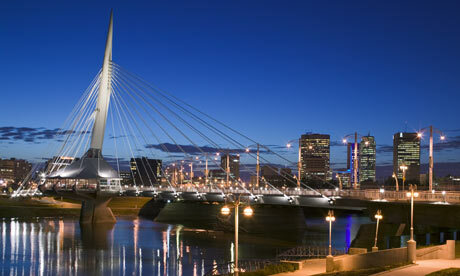 Winnipeg is also known as Canada's "cultural cradle"; it gets this name because of its flourishing arts scene. There is always a show to go to, whether it be a performance by the world-renown Winnipeg Royal Ballet, the Winnipeg Symphony Orchestra, or a major band at the MTS Centre. A huge variety of musicians have called Winnipeg home, including The Weakerthans, The Guess Who, Propagandhi, Wailin' Jennys, Neil Young, and every Canadian child's favourite, Fred Penner. The city itself has a lot to offer, with areas like Osborne Village, the Exchange District, and St. Boniface filled with shops and restaurants. There is no shortage of places to eat and hang out; Winnipeg has over 1000 restaurants, with new bars and coffeeshops opening monthly. There's also the Forks, Winnipeg's most popular tourist destination. Busy all year, this market/meeting place has historical significance going back 6000 years. Personally, my favourite place to go in the city is the abandoned Trappist Monastery in St. Norbert; it's a relaxing spot on the river, and great for photo opportunities. At the end of the day, however, all of these things to do and places to eat and musicians to hear aren't the ultimate reasons to visit Winnipeg. Let's be honest: every city has those things (even though Winnipeg's are pretty darn awesome). The real reason to visit Winnipeg is because it will open up its arms to you, welcome you in, and make you its best friend. Of all the places I've been, it's still one of the friendliest cities in the world, and its people are some of the most fun-loving, creative, genuine, and accepting people I've ever met. It's a fairly big city, but you won't get lost in the shuffle, you'll fit right in. And so, to those who never considered or never wanted to visit Winnipeg, I urge you to give it a chance. You'll more than likely leave with a desire to come back. Brenna is a traveller and a writer and while she currently calls Winnipeg home, she's lived in Japan, Scotland, Denmark, Russia and will soon make the move to London, England. She's travelled to over 80 countries and her love for travel is truly awe-inspiring. She loves red wine, spending time in book shops, scuba diving and hot dogs. I like Winnipeg!! I feel like I could have written a similar piece about my prairie town(Saskatoon). I hope people start to realize there is more to Canada than Vancouver, Toronto and Montreal. And it drives me crazy when people say "oh, I'm sorry!!" when I tell them where I'm from! The prairies rock! my very favorite thing about the city aside from the people was the food. i have lived in germany for 6 years and some of the best german food i have ever eaten was in good ol winnipeg! i found out from some of my clients who live there that winnipeg is the test market for all of canada when it comes to new restaurants or brands emerging...so that is why some cool products can be found there and nowhere else. hope to visit again in the near future! Thank you so much for asking me to be a part of this! It was great to write about my hometown. Keep up all the good (and patriotic) work! Love Brenna and her blog! Winnipeg has never been on my radar at all though -- it's probably the snobby Toronto girl in me... :-) Seriously, though, I think a huge reason as to why I haven't travelled much in Canada is that it is just prohibitively expensive. If I'm going to spend $600 on a plane ticket, I'd rather fly to Guatemala or London that Winnipeg or Calgary. I think that's probably the same line of thinking some other Canadians have. It's such a shame though! You're right - it isn't cheap to travel in Canada. That's exactly the reason we haven't gone East. I've got a pretty good grasp on BC, AB & SK but would love to see Maritime Canada. We priced it out a few years ago and we could easily fly to Europe cheaper - ridiculous! Someday, probably after we've returned to Canada, we'll do it. Joe's Dad was telling us all about a cross country trip he did as a young kid and it has Joe aching to do the same.